For that last reason, I had started to look at learning more about drupal, since I have seen a number of jobs looking for drupal developers recently. 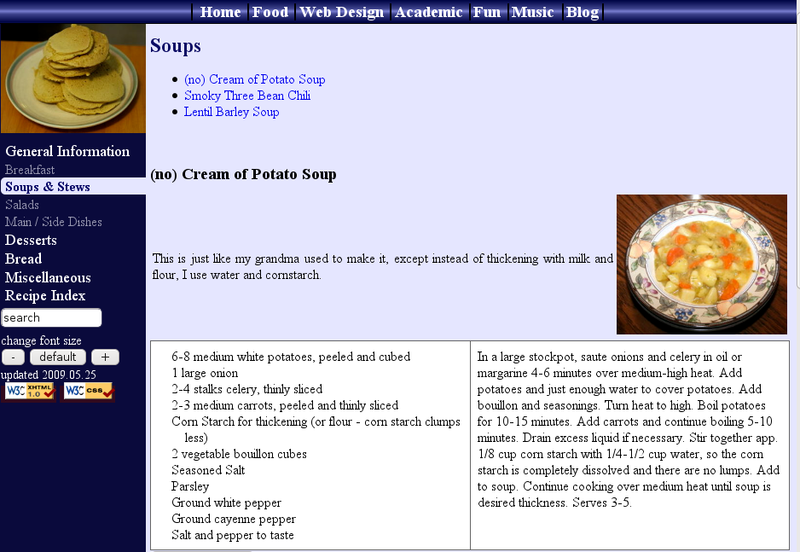 I spent a week or so looking at that in June, and got a little bit excited about a recipe module I found. However, I decided that I wasn’t crazy about drupal. I think WordPress is miles ahead of drupal in many ways. I was very surprised to find out that uploading pictures is not part of the core of drupal, but rather in a module (and not a very good one at that). Of course, up until WordPress 3.0, WP was mostly just a blogging platform. No longer! With version 3.0, WordPress can easily be used as a full-fledged content management system. So I decided to integrate the disparate portions of my website all into WordPress. During the conversion process I got to learn more about the new features in WordPress 3.0, especially custom post types. As I started to figure out how I wanted the navigation for the site to work, I also realized that I wanted to update some of the WordPress navigation plugins I have written – Collapsing Categories, Collapsing Archives, and Collapsing Pages. I added support for custom post types for the first two, and added an option for the pages plugin to only list subpages of the current page (this is how the navigation works for the academic, web design, and wordpress plugins portions of the new site). These features are all in the development versions of the respective plugins right now, but I should put out a new stable release soon. I also added in some CSS3 features, including rounded corners with border-radius, and gradients as well. As always, it is still a work in progress. Feedback is welcome. This entry was posted in (x)html, css, php, sql, wordpress. Bookmark the permalink. Rob, this looks beautiful! And huge thanks for your wordpress plugins like collapsing archives. Thanks for the great Collapsing Categories plugin! 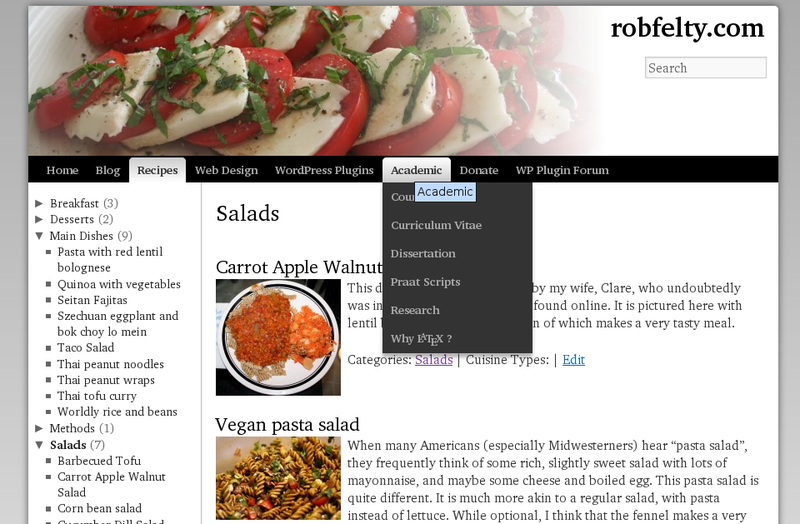 I was able to incorporate it into the WordPress_On_Zencart_v1-5 plugin! 1. The final comment on your blog page for the plugin has a bad link for the forum. 2. Under FAQ or Manual Installation, can you please provide some documentation for defaults.php? I know this is a bit silly, but I spent way too much time trying to figure out how to get the post counts removed… Since the default for WordPress is show_count=0 (off) and your defaults.php has ‘showPostCount’ => true, it would be nice if this was spelled out. I went all through the code thinking I had a show_count=1 somewhere before finally stumbling across the defaults.php (duh.. yeah, I feel dumb.. but I’d feel less dumb if it was mentioned somewhere and I missed it in the documentation).